What better way to celebrate the holidays and the coming of old man winter than with another installment of 80's Bollywood Cheese? Today's song is a true classic that not only was one of the biggest hits of it's day but was the inspiration for a modern day Shah Rukh Khan movie. The song? 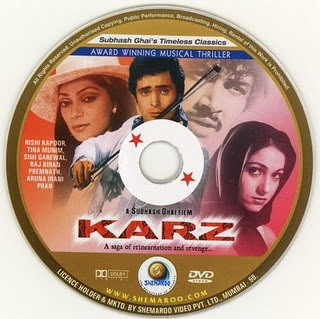 Om Shanti Om from the 1980 movie 'Karz' (in debt). The movie stars two of our all time favorites here at Doc Bollywood - the incomparable Rishi Kapoor and the luminous Tina Munim. It also scored a coup with the casting of Bollywood legend Simi Garewal in a role that earned her a later career Filmfare Award nomination.